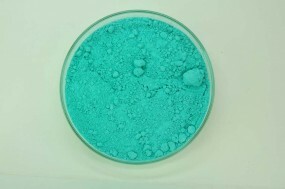 Dioptase, copper silicate | KREMER-made and historic Pigments | Pigments | Kremer Pigments Inc. This rare bluish green mineral is very finely ground. Dioptase has a hardness of 5 which makes it suitable for use as a pigment. It is lightfast, but the color may change in the sun. Customer evaluation for "Dioptase, copper silicate"